Blue Sargent has been told repeatedly that she will the death of her true love, and being the daughter of a psychic, this she doesn’t doubt. Gansey a rich private school student is on a quest to find a long lost welsh king, and with the help of his friends Ronan, Adam and Noah, he is closer than ever. But the path ahead is dangerous, Blue has seen Gansey’s spirit on St Mark’s day, which means within a year he will be dead, and Blue will have a part to play in his demise. With Maggie’s distinct style, The Raven Boys is not only typically Stiefvater, but Stiefvater at her best. It’s a love story, without being a love story, as the journey of the characters take predominance over any romantic endeavours. And yet love hangs in every scene, niggling in the readers’ mind, while at the same time, the threat of death and mystery has you so transfixed that you can’t put the book down. The varied vantage point focus on the characters means that when reading, you feel one step ahead of the characters, and yet you’re not. Maggie is still able to include many twists and turns that will leave your head in a spin, as you’re not quite ahead as you may have thought. Which means absolutely anything can happen, and that is one thrilling possibility. 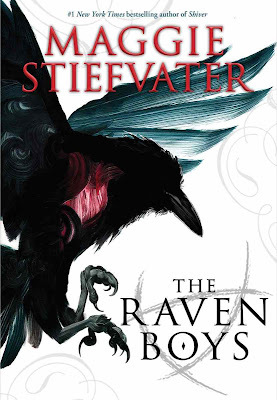 With another two books on the way, there’s plenty more for Blue and The Raven Boys, and I for one am already on the edge of my seat, waiting to find out what will happen next. I have a copy of this! Can't wait to read it now!